Mondo Ernesto: WAY TO GO, JOE! Another Captain America movie is raking in the bucks at the box office. 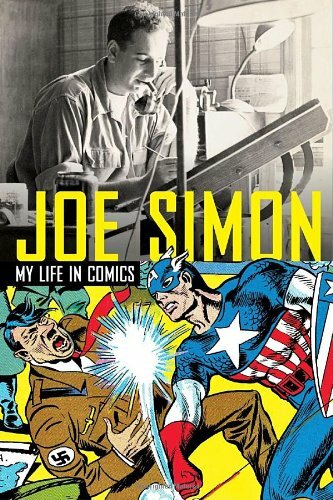 We should take time to remember Joe Simon, who with Jack Kirby created the character. A good way is to read Simon's book, My Life in Comics. It takes us back to the days when superheroes weren't corporate porperty, and comics were created by lively individuals in a mad race to come up with something new to capture the audience's attention. If they were lucky, they could make a living, too. My Life in Comics captures this phase in the history of American pop culture, and the personalities behind it. It starts with Simon's early days working as an artist and sports reporter for the newspapers, and how he got into comic books when things changed, technology allowed for the use of more photographs – he compares it to what's happening with the internet today. We see behind the scenes of the origin of comic books as we know them today. He also tells of the struggle to keep the rights and get credit for his creations, including Captain America. As I work on a comics/illustraton project, this book makes me yearn to be a work-a-day cartoonist. Yeah, things are changing. New media means new opportuinities. A fella can dream, can't he? Meanwhile, Marvel, and DC are becoming faceless corporate entities, like Disney. Will they ever do anything besides reboot their creaky, old franchises?